This place has an amazing selection of fudge which is sold by the half pound slab. But Dan’s is also known for it’s taffy, ice-cream, and chocolates. The fudge is second to none. I’ve never, EVER had fudge this creamy and good. Seriously – I’ve had lots of fudge from many tourist spots (Banff, Grandville Island, the Calgary Stampede, etc. ), specialty shops, groceries stores and so forth — but Dan’s fudge is consistently of the very best quality. As with all good fudge – it’s pure without the slightest hint of wax. Dan’s has many, many flavors (vanilla, marshmallow, chocolate, mint, maple, turtle, and various combinations involving nuts). It’s made in a very old-fashioned way (copper heaters) right before you in the shop. The chocolate fudge is the best in the world – it just melts and then flows down your throat in a wave of cocoa-y goodness. The peanut butter fudge is light and almost fluffy – I never imagined that peanut butter in any form could be this airy. The mint is strong – sort of like what I imagine toothpaste in heaven to be like. And I love any of the flavors that are also packing hidden walnuts. The old-fashioned ice cream parlor in the back is both endearing and delicious. The parlor offers shakes filled with chocolate syrup and whipped cream, ice cream cones piled high, and the works in general. The taffy bins stretch on and on with amazing flavors ranging from caramel to banana to cinnamon. The taffy is smooth, chewy, creamy and addictive. The selection of chocolates, like the taffy and fudge, is extensive. From bear claws to truffles — they’ve got it all. Including sugar-free options. Dan’s will show you that the US not only invented – but also perfected fudge. This place is worth every pound you’ll gain from stopping in for a sweet treat. They also take mail orders – so call ’em up! Enjoy a fun spin of bubblegum. ‘Sugar,sugar’ among others. The New Pornographers first album thrust them immediately into Canada’s musical limelight. This enthusiastic headstrong uber-pop is over-the-top with its relentless quality. Neko, Dan, and Carl never cease to impress. 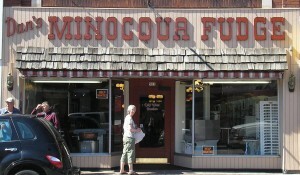 This entry was posted in Album Reviews, Food, Music and tagged desserts, Fudge, minocqua. Bookmark the permalink.